Today was a gorgeous day, though. Plenty of time for slowing down, too. One of the school groups was an hour late, so they skipped my area entirely. The other school group was 3 groups of only 9 kids, so it felt quite leisurely not to be herding 30 kids at one time. That meant that I could sit on the porch sewing, enjoying the quiet during the off hours. Three photographers with tripods and bunches of gear came by and snapped away. The Schottler farm is a still life paradise, really. And so monochrome friendly! Although the delphiniums in full bloom definitely deserve color. I’ll be a Villager next, five days a week. At Mary Hafford’s house, I do get a kitchen garden with lavender, sage, thyme, and rosemary. And I need to learn how to crochet rag rugs. It’ll be fun. Too bad I don’t know any welcoming phrases in Irish! This entry was posted in Education, History, Home Economics, Traveling and tagged education, history, homemaking, Old World Wisconsin. Bookmark the permalink. Rhubarb and apple pie is good, too ! The acidity of rhubarb blends perfectly with the sweetness of apples 🙂 And the sherbet looks SO tempting …. Félicitations to the chef ! My mother used to make strawberry rhubarb pie, another stunning combination, but I do like cinnamon with rhubarb, so I’m guessing that fits with apple perfectly! Here you are Scilla.. It’s Failte in Irish http://www.youtube.com/watch?v=yDnpkisnk2s and the sherbet looks delicious! 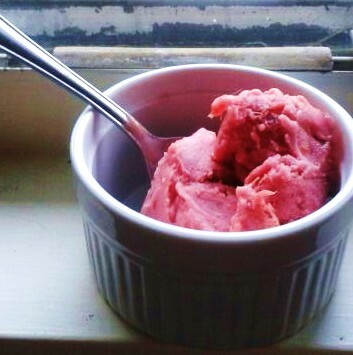 I am going to have to try to make rhubarb sorbet. It does look wonderful! Good luck at the Hafford House. You get all the fun of a new house without having to haul boxes and boxes of stuff.